If you’re an enthusiast builder or are looking to purchase a pre-built PC for later upgrading or overclocking, then there’s one integral component to pay close attention to. The motherboard is the piece of the puzzle we’re talking about. The motherboard serves as the foundation for the rest of the system’s components. It’ll determine the processor you can use, the peripherals to attach, the memory size to have on board and the features of your PC system. As a fast-time buyer or builder, a motherboard can be a complicated product with sophisticated jargon and specifications that’ll get your head spinning. Upon hours and hours of research reading consumer reviews on forums, we identified and reviewed the best mini ITX motherboards there’s. For quick comparisons at a glance, check out the mini ITX comparison table. We’ve also included a simple buyer’s guide that we hope will arm you with the basic knowledge regarding motherboards. For a sterling performance, ASUS Rox Strix B360-I Gaming supports 8th Gen Intel Core Processors with socket LGA 1151. It features customizable RGB lighting that immaculately illuminates your system. The mother supports DDR4 and has 4 DIMM slots for expanding the RAM up to 64GB. It also comes integrated with a pretty solid expansion slots and ports profile with PCIe 3.0 slot, m.2 port, DisplayPort, HDMI, and DVI. The Gigabit LAN and 802.11ac Wi-Fi provide reliable internet connectivity. ROG Strix X470-I Gaming is powered by AMD Ryzen AM4 2 & 7th Gen Athlon processors. Embedded on this motherboard is an AMD X470 chipset that guarantees unmatched performance so you can outshine the competition. The socket type is AM4. Also, ROG Strix X470-I features two DIMM slots. It supports the DDR4 RAM and allows you to expand the memory up to 32GB. ROG Strix X470-I Gaming lets you explore your PCs intelligence in just a single click with the ASUS 5-Way Optimization. This property optimizes the integral aspects of your system for easy overclocking and efficient cooling. However intense the task gets, your fans will spin whisper-quiet and provide good airflow keeping the entire system chill. Gain total control over the fans, water pumps, and the AIO coolers through Fan Expert 4 or UEFI. It does matter if your system uses air cooling or water cooling, the Auto-Tuning will have it all configured. What’s more, the motherboard comes integrated with ROG’s SupremeFX audio technology, which, on the line-in connections, renders outstanding 113dB signal to noise ratio. In regards to connectivity ports and expansion slots, ROG Strix X470-I doesn’t lag. It comes with an M.2 slot, 1x PCIe 3.0 x 16 slot and USB 3.1 Gen 2 port. It also uses the latest WiFi 802.11ac protocol and has a Gigabit LAN port that delivers reliable internet connectivity. And for your graphics, there’s an HDMI port. The motherboard packs premium aesthetics with ASUS Aura that offers RGB lighting control. Use the functional presets to control the built-in RGB lighting and the strips embedded on the onboard RGB header. Designed to support the 6th and 7th generation Intel Core processors, GIGABYTE GA-Z270N-Gaming 5 Mini-ITX Motherboard delivers outstanding performance. It’ll transform your gaming experience. The motherboard comes integrated with Intel Z270 chipset and will work with your system provided the CPU socket type is LGA 1151. GIGABYTE GA-Z270N-Gaming 5 comes with 2 DIMM slot. The 4 DDR4 RAM slots allow you to expand the RAM of your built up to 16GB. In regards to connectivity, the motherboard features USB 2.0, USB 3.0, USB 3.1 Gen 1 and USB 3.1 Gen 2 that allow for high-speed data transfers. For expansion, GIGABYTE GA-Z270N-Gaming 5 features PCIe x4 and PCIe x 2 slots. It also has M.2 slots. What's more, GIGABYTE GA-Z270N-Gaming 5 offers a reliable connection through the incorporated Windstorm Peak WiFi. If you have access to a wired internet, take advantage of the Intel Gigabit interface. If you value aesthetics, then you’ll appreciate the customizable RGB lighting that illuminates your system. Easily control the lighting through the BIOS or via the Windows using RGB Fusion App. There’s a good chance that next in quality and performance after ASUS motherboards comes ASRock. And in this case, we highly recommend ASRock Z270M-ITX/ac. 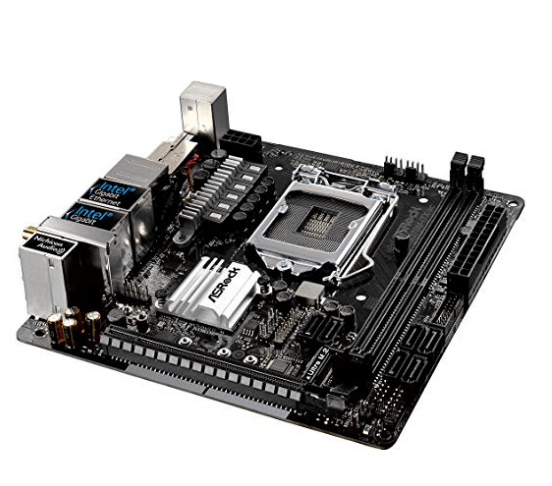 ASRock Z270M-ITX/ac motherboard has an Intel z270 chipset. It supports the 6th and 7th generation of Intel core processors i.e. Celeron, Pentium, i3, i5 & i7 with socket type LGA 1151. The motherboard delivers solid performance. Even better, you can expand the random access memory of this baby. It comes integrated with 2xDDR4 slots that you can use to expand the RAM to 32GB. ASRock Z270M-ITX/ac also scores pretty well in regards to expansion slots and ports available. The mini-ITX motherboard comes integrated with 1xPCIe 3.0 x16 slot that you can use for things like the graphics cards. What’s more, the motherboard has a port profile with 8 USB 3.0 ports, 4 USB 2.0 ports. For your keyboard and mouse, the board features 1xPS/2 port. There are also 2 HDMI ports, a DisplayPort, dual antenna ports, LAN ports and audio In/Out jacks. And for reliable wireless connection, it comes with a Wi-Fi card. ASUS Mini-ITXc H971-PLUS will support the 4th and 5th Generation Celeron and Pentium Intel Core Processors and has an LGA 1150 socket. The mainboard comes integrated with Intel_h97_express chipset. Regarding connectivity options and expandability, ASUS Mini-ITXc H971-PLUS checks most of the boxes. There’s a 1xPCIe 3.0 x16 slot perfect for graphics cards. Also integrated on the board are SATA 6Gbps ports, HDMI, DisplayPort and USB 3.0. The motherboard supports 2xDDR3 DIMM and allowing you to expand the RAM up to 16GB. That’s a little of a bummer considering DDR4 is the current memory type. But that doesn’t stop ASUS Mini-ITXc H971-PLUS motherboard from scoring high in performance. Located at the bottom is an M.2 socket interface perfect for supporting your SSD storage. With an SSD on board, the motherboard can deliver data transfer speeds as high as 10Gbps. With the included Crystal Sound 2, ASUS Mini-ITXc H971-PLUS ensures that your system delivers immersive sound for your games, videos, and music. The motherboard also has outstanding hardware protection with ASUS 5x Protection that offers optimized DRAM overcurrent protection, superior-quality 5K-hour solid capacitors and more. If you’re a gaming enthusiast, you know that the quality of your motherboard will determine your success in the multiplayer quests. MSI Performance B450I Gaming Plus AC motherboard will load your games faster and grant you a competitive edge. MSI Performance B450I Gaming Plus AC supports the 1st & 2nd Generation Ryzen AMD processors or Ryzen processors with Radeon Vega Graphics. The motherboard has socket AM4 compatible with your processor. What’s more, MSI Performance B450I Gaming Plus AC supports DDR4 with RAM expandable up to 32GB RAM. Integrated are PCIe Steel Armor slots, which are reinforced on the motherboard with more solder points so they don’t suffer damage how large graphics cards installed are. Explore and experience the world of virtual reality in your gaming escapades with a VR-ready gaming motherboard. It optimizes your system’s performance immersing you fully into virtual reality like never before. Also, this mini-ITX motherboard RGB LED strips that immaculately illuminate the system. Plus, you can control the RGB lighting the MSI’s Light Extension pinheader. MSI Performance B450I Gaming Plus AC features PCIe 3.0 x4 slot and can support data transfers up to 32Gb/s. The integrated Audio Boost guarantees the best quality audio for your games. Also featuring on the board are a PS/2 port for the mouse & keyboard, LAN port, Intel Wi-Fi & Bluetooth, DisplayPort, and audio jacks. Crafted to support the 8th Gen Intel Core Processors with socket LGA 1151, ASUS ROG Strix B360-I Gaming is set to deliver sterling performance. ASUS ROG Strix B360-I Gaming features inbuilt RGB LEDs and strips embedded on the RGB header that illuminate your rig with an endless spectrum of colors effectively ushering in a sleek gaming atmosphere. Plus, you can customize the RGB lighting and even Sync it with a wide array of Aura Sync devices. The motherboard supports DDR4 with 4 DIMM slots to expand your gaming rig’s RAM up to 64GB. ASUS OptiMem helps improve memory stability and performance effectively maintaining the signal integrity. ASUS ROG Strix B360-I Gaming comes with 1x PCIe 3.0 x 16 slot, and M.2 port for SATA and PCIe 3.0 for excellent expandability. Integrated on the motherboard are DisplayPort, HDMI, and DVI for graphics output. There's also Gigabit LAN as wells 802.11ac Wi-Fi for reliable internet connectivity. Enjoy superior quality in your games, videos, and music with SupremeFX S1220A. What’s more, with ASUS ROG Strix B360-I Gaming motherboard, you have total control of the system’s air or water cooling through Fan Xpert 4 or the popular UEFI. A single click in the Auto-Tuning mode will get the motherboard to intelligently configure all the parameters. The Extreme Quiet mode reduces the speed of your system’s fans below the expected minimum so they can operate quietly while ensuring sufficient airflow. ASUS ROG Strix B360-I Gaming features a sleek matte black pre-mounted I/O shield that’s yet to be patented. Pre-mounting makes it simple to install the motherboard into your system. Sporting a slim ultra slim design, Jetway NF9HG-2930 is a high-performance networking motherboard for your build that you won’t go wrong investing in. The motherboard comes integrated with Intel Celeron N2930 Processor pre-configured with the Quad Intel LAN ports. What results a CPU motherboard combo. Jetway NF9HG-2930 also comes embedded with Intel HD graphics with a frequency ranging from 313MHz – 854MHz. What’s more, this mini-ITX motherboard supports 2xDDR3L SODIMM memory. Use the 2 DIMM slots to expand the RAM up to 8GB. As regards expandability and ports, Jetway NF9HG-2930 also scores pretty well. It has support for 2xSATA drives and features 1xmSATA slot. It also comes with 2xPCIe 2.0 slots. Integrated on the motherboard, too, are 4x Intel i211AT Gigabit LAN interfaces. The Gigabit Ethernet offers a reliable internet connection. Besides, Jetway NF9HG-2930 motherboard comes with a 3G SIM card interface. Performance is the aspect upon which to judge a motherboard. And for a good reason, EVGA Z270 Stinger highlights that fact pretty well. With a full range of powerful features crammed into this little guy, the mini-ITX motherboard delivers the performance of a full-sized motherboard. EVGA Z270 Stinger supports most Intel Core 7th Generation processors provided they have the LGA 1151 socket. The motherboard comes integrated with a next-gen Intel Z270 Chipset. What’s more, EVGA Z270 Stinger supports DDR4 memory with dual DIMM slots. Easily expand the RAM up to 32GB. This motherboard comes with a pretty solid expansion and ports package. Aside from the 2xUSB 2.0 ports and 8xUSB 3.0 ports, it also features the latest 2xUSB 3.1 ports, both Type A as well as Type C.
EVGA Z270 Stinger also comes embedded with a SATA interface. An M.2 slot allows for storage and extreme data transfer speeds up 32Gbp/s. For your mouse and keyboard, the motherboard has the 1xU.2 port. Integrated with Dual-Band Wi-Fi and Bluetooth, EVGA Z270 Stinger offers reliable wireless internet connection. Pair and share data/files with other Bluetooth-enabled devices. Designed to support AMD 1.5GHz Duo-Core Turion II Neo K625 Processor with LGA 1156 Socket, ZOTAC Turion II Neo promises to offer the next-gen performance. The motherboard uses AMD M880G + SB820M Chipset. ZOTAC Turion II Neo supports DDR3 with 2 DIMM slots that you can use to expand your system’s RAM up to 8GB. What’s more, the motherboard features excellent expansion capabilities with 1xPCIe slot and a mini PCIe slot. The mini-PCIe slot houses the Wi-Fi module. Onboard are 3x SATA3 ports and support for RAIDs. Regarding connectors, ZOTAC Turion II Neo doesn’t disappoint. It comes with several ports including 8x USB 2.0 ports, 2x USB 3.0 ports, and a PS/2 port for your mouse and keyboard. There’s also a DVI port, HDMI port, and Audio I/O jacks. 2xWi-Fi antennae connectors and 1x RJ45 LAN offer reliable wired and wireless internet connection. For the video graphics, ZOTAC Turion II Neo features Intel ATI Radeon HD4200 graphic controller. Integrated with Intel J3455 Quad-Core 2.30GHz Processor, ASRock J3455B-ITX promises excellent performance and reduced power consumption. It uses a robust capacitor design with solid caps to ensure the motherboard delivers stable performance and lasts long. The motherboard/CPU combo supports DDR3/DDR3L with 2 DIMM slots that allow you to expand the RAM up to 16GB. ASRock J3455B-ITX takes pride in its excellent port and expansion slots that allow for more possibilities. It comes packed with 1xPCIe 2.0 x16 slot and 2xSATA3 6.0Gbp/s connector. Integrated on the board, too, are 4 USB 2.0 ports, and 2xUSB 3.0 ports. There's also a PS/2 port for the mouse & keyboard, D-Sub, HDMI port, COM ports, HD audio jacks and more. Motherboards feature sensitive components susceptible to power surges in the face of inefficient management. ASRock’s Full Spike Protection has the necessary technologies to cushion these components from damage whenever there are unexpected voltage spikes. Regardless of the motherboard size, the socket takes first place as the most important factor to consider. A socket is a receptacle through which the processor attaches to the mainboard. Something interesting is that not all processors of a particular socket type will work with every motherboard bearing that exact socket type. It, therefore, means you should check for compatibility first before buying. Currently, socket 1151 is the mainstream socket integrated on the Intel’s latest Core, Celeron and Pentium processors. Socket 1151 first came with the Skylake 6th Gen Intel Core processors. The socket is now available in the Kaby Lake 7th Gen processors and 8th Gen Coffee Lake Intel Processors. In the case of the 8th Gen Intel Processors, it’s only compatible with 1151 Socket boards based on the 300-series chipsets. AMD has the process relatively easy. At the moment, all the current mainstream AMD processors including AMD Ryzen, the 7th Gen A-Series, and Athlon, use the same AM4 socket and it’ll be that way for some time. Your motherboard size and the memory slots onboard will determine the size, type and speed of memory you can install. The number of DIMM slots determines how much RAM you can add on the motherboard. Most motherboards feature two to eight DIMM slots. The latest crop of consumer motherboards supports either DDR4. But most of the last generation motherboard still have DDR3 slots. The rule of thumb when making the decision on the memory factor is to establish how much memory you need and the possibility of expanding it in the future. Today, you’ll come across four major expansion slots, the short PCIe x 1 slot and the longer PCIe x16 slot. In between, we have PCIe x 4 slots and PCIe x8 slots although x4 and 16 slots are the most common. These PCIe slots dictate the connection throughput as well as its size. PCIe x1 slots come in handy when you want to expand USB and SATA while PCIe x 16 slots come in handy for things like graphics cards and RAID cards. Before you can settle on any particular motherboard, be sure to check that the I/O interface on the board has the necessary external connection options you’ll require. There’s a whole list of ports although you only need to confirm that the mainboard features the ones you’ll need. USB 2.0 and USB 3.0 are the most common and no explanation is needed here. Currently, we have the latest standards, USB 3.1 Gen 1 and USB 3.1 Gen 2. USB 3.0 and USB 3.1 Gen 1 support a wide array of peripherals. While USB 3.1 Gen 2 delivers up to 10Gbps bandwidth, there are still limitations in regards to the number of peripherals supported. USB Type C is like a combo of USB 3.1 Gen 1 and USB 3.2 Gen and works well with the latest USB-compatible devices. What audio ports are embedded on the board? These are important for connecting your headphones and speakers. If you plan to use the older models of keyboards and mice, then check that your motherboard features PS/2 ports. Although a rare feature in the cheaper mini-ITX motherboards, a couple of motherboard models have integrated it through dedicated add-on cards. With this, you’ll be in for extreme data transfers as high as 40Gbps. Some Intel processors come integrated with GPUs that help the monitor output visual information. Accelerated Processing Unit (APU) is the AMD’s version of graphics card that combines both the CPU and GPU as a single package. High-end motherboard models also feature a couple of extra features. WiFi card is important if you don't have access to an Ethernet port. For a reliable wired internet connectivity, the motherboard ought to dual Ethernet ports. LED diagnostics readouts and on-board ON/OFF switches are others. If you're a builder, then you probably know a couple of things regarding motherboards. But for the beginners, there's so many complicated specs and terminologies that not a single soul will blame you for being confused. But to make it simple to choose a motherboard, we suggest that you pay close attention to the CPU socket, memory & the possibility of expanding it, GPU, expansion slots, and the ports available. Illumination is also a great feature to have. If motherboard scores highly in all these aspects, then all else becomes secondary. We hope you’ve found a stellar-performance motherboard for your build.